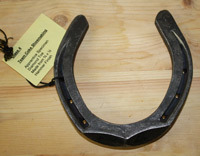 Competition Results 2009 have been sponsored by Jim Blurton Specialist Shoes, the leading supplier of bar shoes by a World Class farrier. 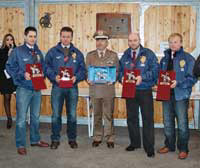 The 24th Italian European Team Farriery Championships held at the amazing “Fieracavalli” Festival of the Horse in Verona, Italy began on November 6th with teams from Germany, Italy, France, Spain, Switzerland and England. 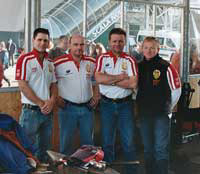 This year’s England team consisted of three members from the current ‘International’ Championship team; David Smith, Gavin Golby, Matt Randles and joining them former England team member & World Champion finalist Nigel Fennell . 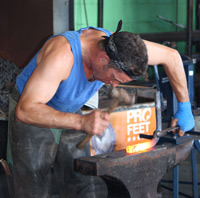 With only 2 weeks’ notice, practice of the shoes was limited but thankfully all four of the team were familiar with Italian shoemaking from previous experience at the competition. 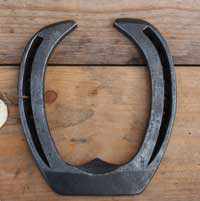 The four shoes to be made were the Italian Bar shoe, Hind “Rabbit” shoe, Italian Jumping Hind shoe and a Mule shoe with round Calkins - all to be made in 1hr 50 minutes with just a 5mm tolerance. 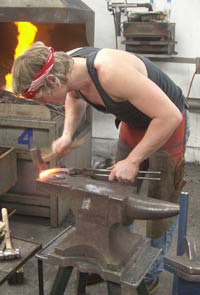 The first day was the beginning of the shoemaking with all the members of the teams battling throughout the day to gain as many points as possible for their country. 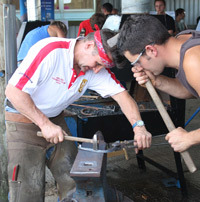 One team member from each country with the highest shoemaking score qualified to represent their country in the shoeing final. Following a tense night (aided by a relaxing drink in the bar!) 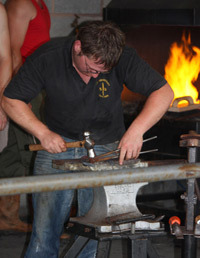 the results were announced the following morning - England were well in the lead as a team and dominated the top five placements as individuals with Nigel Fennell winning the shoemaking and so qualifying to shoe in the final. 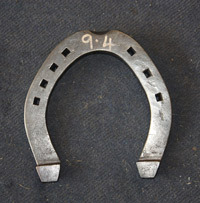 The final consisted of making and fitting an Italian Fullered Front shoe and a Italian Jumping Hind shoe; each shoe requiring an exceptionally high level of detail in both the forging and the fitting. 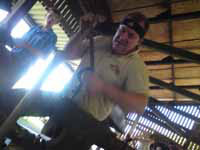 With the assistance of David Smith acting as fireman the class ran fairly smoothly with the only exception being a slightly uncooperative horse! 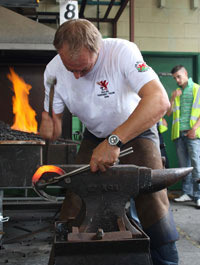 Undeterred an excellent job was produced ensuring Nigel completed a terrific competition for England with team and individual wins, Nigel said “we all had such strong shoemaking rounds the previous day anyone of us could have made the final and it really put us in a good position for day two, we had such a great time together, and it was a real honour to be in such a strong team with David , Gavin and Matt, three of this year’s England team International Champions”. 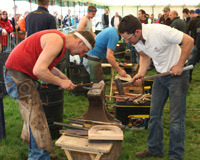 Well the National Hunter Championship is now re-establishing itself in the shoeing calendar, this year drawing the maximum 32 shoeing competitors and also 30 young and keen apprentices, traveling many miles with very early starts. 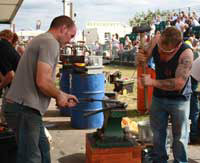 People travelling from as far as Cornwall, Lancashire, Kent, Wales and Scotland - their support is much appreciated by the organisers. 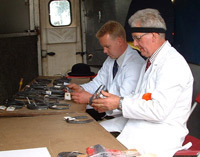 The day began at 9 o'clock with the judge Mr Gary Darlow placing the specimens' on the board; a tool and fullered caulkin and wedge for the open competitors and a concave caulkin and wedge for the restricted class. 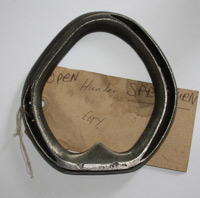 8 fine Somerset hunters were lined up and the shoeing started at 9.30am, 50 minutes to shoe the drawn foot and make the specimen ! 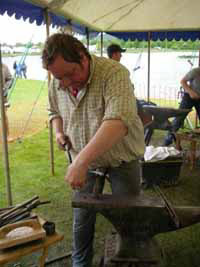 By the end of the first round of shoeing the apprentices' had arrived for their first round at 11am - the morning round of 45 minutes was to make a pair of Hunter front shoes from a gas forge. 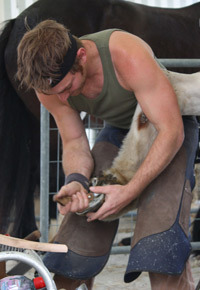 The second round in the afternoon would see 1st & 2nd year apprentices make hunter hinds and the 3rd & 4th year apprentices make a pair of caulkin & wedge hinds in 50 minutes. 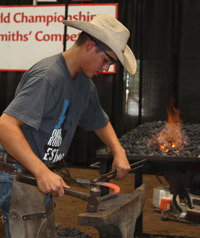 Both pairs would be judged as a set to find the winner in each class. 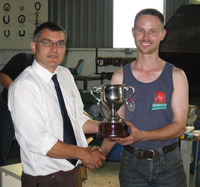 The judge for the apprentices was Mr . Andy Reader Smith. 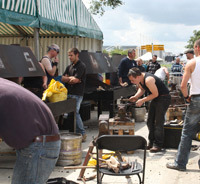 Lunch was taken at 1pm with beer, cider and food on hand for everyone and also time to have a look around Wessex Farriers Supplies Ltd trade stand, displaying the full Jim Blurton range of tools along with other bargains to be had - many thanks to them for coming along. 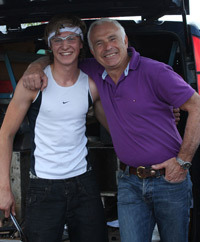 By 4pm it was time for another beer and a rest, all done bar the scores! The day had gone with out a hitch with fabulous horses that stood rock solid all day, a huge thank you to our owners who loaned the horses for the day. 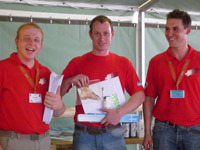 Apart from a small shortage of bar stock for the apprentices which was overcome the day was a great success. 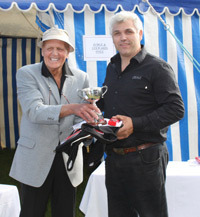 A big thanks must go to Mr John Ford for his time keeping and address system keeping rounds moving to time . 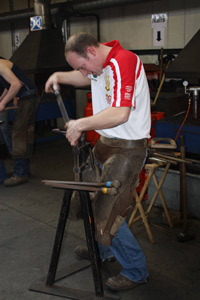 Many many thanks to Jim Blurton Tools, who three years ago became title sponsors providing a Bronze statue trophy for the Open class and also prizes for all the other classes - we thank them for continued support. 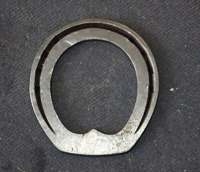 For individual marks please email us. 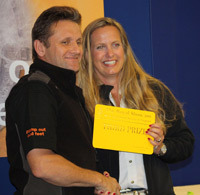 We had a great show with full entries. 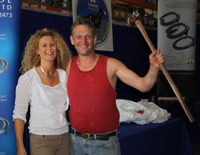 Many thanks to our sponsor Stromsholm with out who we could not put on the show. 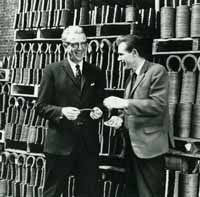 Cecil Swan for the loan of his excellent forges. 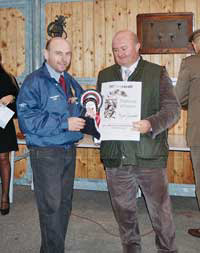 All the stewards for their help and of course this years judge, Mr Grant Moon a brilliant and fantastically professional judge. 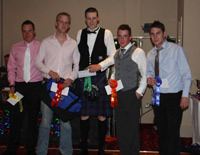 Best specimen - Duncan Thomson. 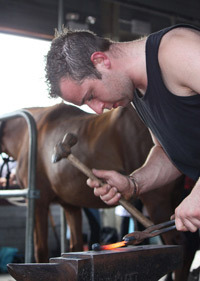 The Stromsholm Newmarket Apprentice Seminar 2009 was a great success, we had 35 apprentices competing on the Saturday and had 26 Farriers/Apprentices join us on the Friday for the Jim Blurton Clinic. 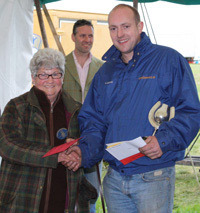 Mrs D Hicks, The Worshipful Company Of Farriers, Eastlake & Beachell, Stephen Hill, Westerham Gun Club, Stromholm, Mustad & G W Day & Co for their kind sponsorship. 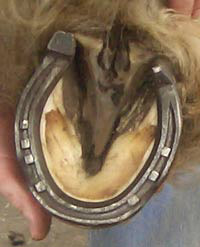 For complete results visit the NAFBAE website. 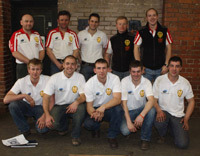 ...and to Lasswade Riding School for providing us with the horses. 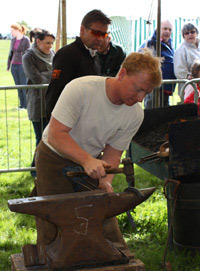 Staffordshire Branch NAFBAE farriers organised National Show Hunter Shoeing and Shoemaking Competition. 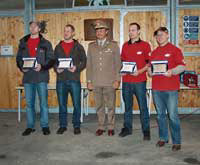 Grateful thanks do to all who helped and competed, making the 3rd annual competitiona great success. 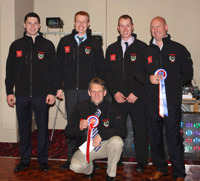 Thanks to judges John Hughes and Charlie Hughes who did a fantastic job throughout. 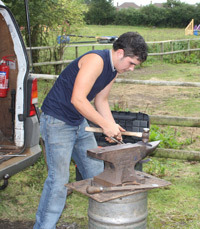 Also, thanks to sposnors Jim Blurton, Mustad, Horseshoe and Farrier Supplies (Midlands) Ltd, and the Newport and District Agricultural Society for their generous support. 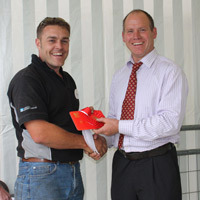 Best Apprentice Sponsored By B.L Farrier Supplies Ltd - J. C.Lee. 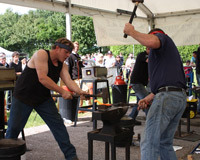 We had a successful three days at the Kent County Show, with over 60 entries spanning the three days. 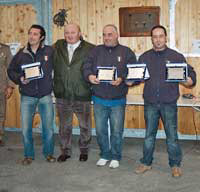 I would like to thank our judges Stephen Newman and Trevor Stern for their hard work, and the stewards and helpers for the smooth running of the competition. 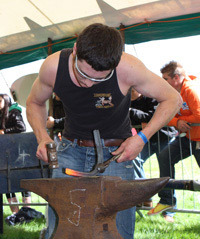 I would also like to thank our sponsors Corralls Coal Merchants (Canterbury) for supply the coke, I S & G Steel Stockholders (Beckenham) for supplying the flat bar metal and Kent County Agricultural Society for their support and very importantly all the competitors for travelling near and far to come to Kent, we hope to see many of you again next year. 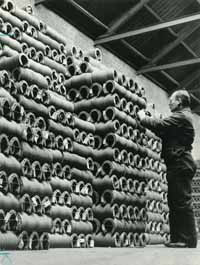 Stewards - John Britland, Huw Dyer, Rodney Cranwell, Josh Ramsey, Chuck Jones, Gary Burton and all those apprentices that have helped clear up. 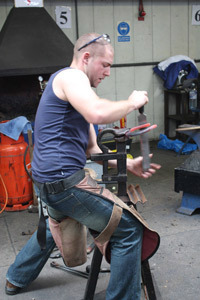 The organisers would like to thank all of the sponsors for their support in particular to Handmade Shoes (UK) Ltd for the particularly generous sponsorship. 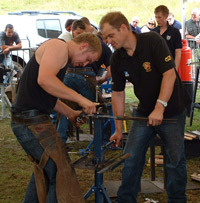 The competition went extremely will with 11 competitors in the Open and 9 in the Apprentice section. 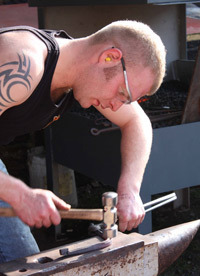 This year the competition even had an international visitor, Josh Ramsey, who is currently in the Exchange and we wish him the best of luck. 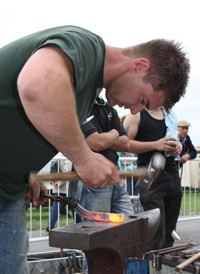 The 125th Lincolnshire show Farriery completion was held the Wednesday and Thursday of the 24th & 25th of June. 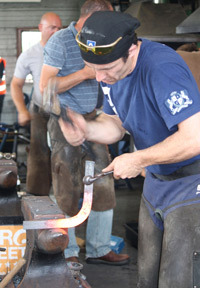 Although entries were low, high standard of work was produced. 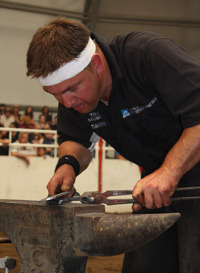 This year the judge was Stuart Spence. 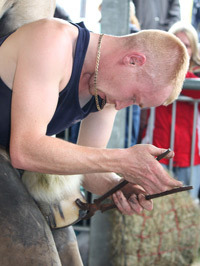 The Wednesdays Competition included the Open hunter shoeing of which. 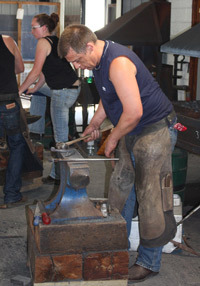 Apprentice Shoemaking was held over the two days as was the Open therapeutic shoemaking Class. 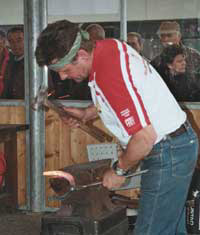 On Thursday the Open Roadster was held. 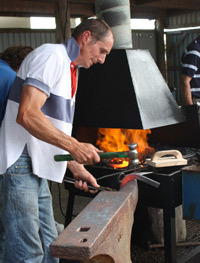 This year was successful down to the new Coke forges brought for the forge by the Lincolnshire Agricultural Society. This has made a massive difference to the event. 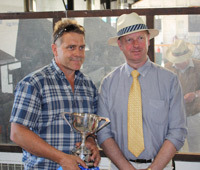 Many thanks go to the Judge Stuart Spence, Chief Steward Adrian Middleton and the Sponsors Stromsholm and Arthur Cottams. 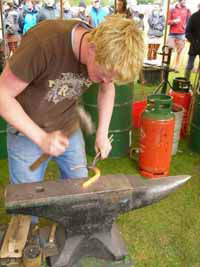 Looking forward to next year’s competition, over the winter there are plans to revamp the old forge and make it a bit more “user friendly”. 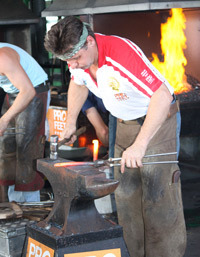 The format for next year’s competition is also having a revamp. 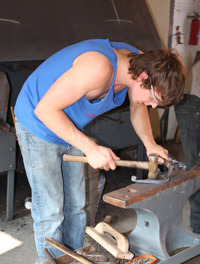 On the Wednesday there will be both the apprentice shoemaking classes and the Open Roadster Class. 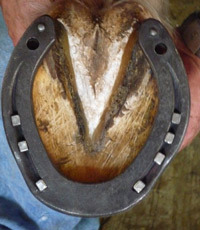 On the Thursday there will be a new Master and Apprentice Hunter shoeing and shoemaking class. 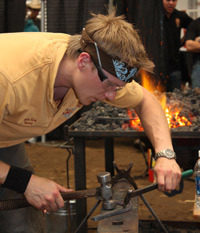 Details and format for this class will be announced at the beginning of 2010. 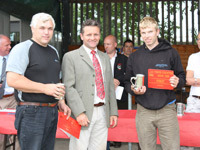 Lastly a big thank you to all those who turned up and competed. 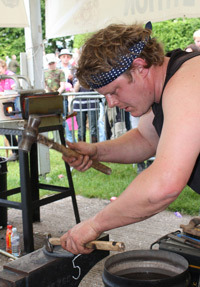 Hope to see you all next year. 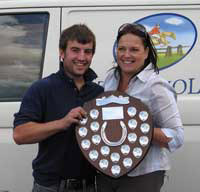 Full results and individual marks can be provided, please email Claire. 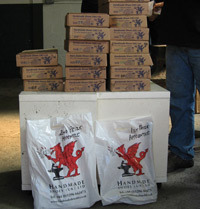 The Committee would like to thank Handmade Shoes (UK) Ltd for their generous sponsorship of the competition. 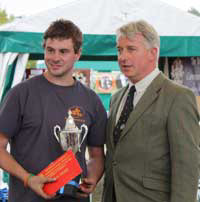 Special thanks also to judge, Jay Tovey, and the Stewards for their extremely hard work and Wayne Upton of the Worshipful Company of Farriers for the presentation of medal and prizes. 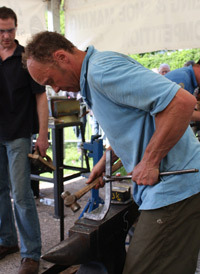 Special thanks must also go to Graham and Gary Harland, Huw Dyer, Mark Mattheson and Johnny Atkinson for supplying anvils and equipment without which the competition would not have gone ahead. 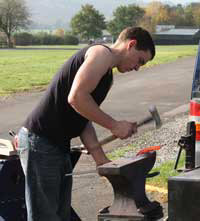 A total of 65 farriers and apprentices took part in the annual farriery competition organised by the Staffordshire Branch of the National Association of Farriers Blacksmiths and Agricultural Engineers. 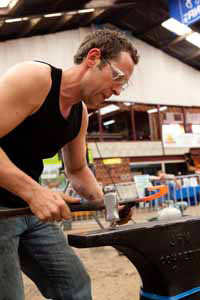 This year a new speed shoemaking class provided a challenge to the competitors who had to make a 3/4 fullered caulk and wedge in 20 minutes. 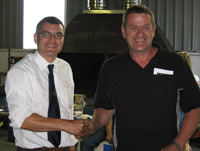 Grateful thanks to the Staffordshire and Birmingham Agricultural Society who have provided an excellent venue for the event. 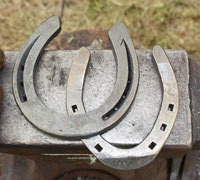 Thanks also to Horseshoe and Farrier Supplies for sponsoring the competition and to Mustad who provided brand new O Dwyer Damascus forges for use at Staffordshire Branch events. 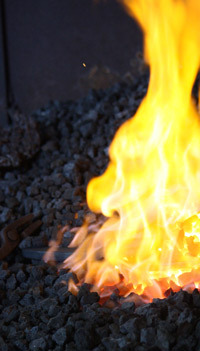 The forges performed faultlessly throughout the two days proving to be very versatile, giving a controllable and enormously efficient heat when needed. 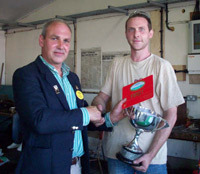 Competition secretary Jonathon Nunn would like to thank all who supported the event such as stewards and officials, and Mike and Jackie Randles of Logotec Embroidery for the generous help with t-shirts, stewards clothing and prizes. 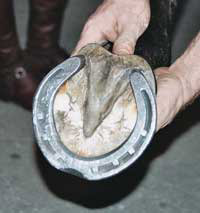 Judge Mark Preece did a fantastic job and provided some excellent specimen shoes for us. 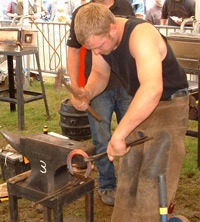 He commented on the high standards of work he saw over both days. 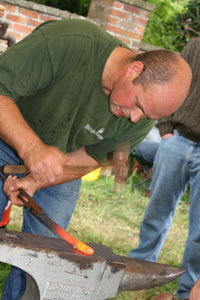 With thanks to Ian Gajczak for kindly supplying the photographs. 1st - Ed O'Shaughnessy & Will O'Shaughnessy. 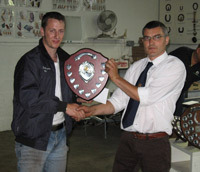 3rd - Tom Farmer & Stephen Hill. 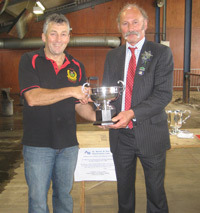 Reserve - Robert Shave & Mark Thompson. 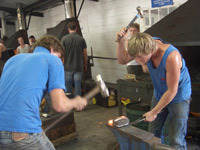 Local class for apprentices residing in Suffolk, Norfolk, Essex or Cambridgeshire. 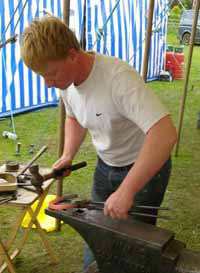 Forges kindly sponsored by Vaughns (Hope Works). 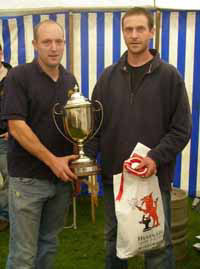 Organised and run by Jon Foyle DWCF and Mike Burgoyne DWCF. 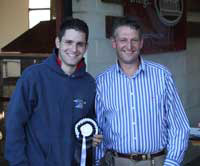 Thanks to Jon Foyle for kind permission to publish these results, for a breakdown of scores and for full results please visit Tom Ryan's website Equinehoof by clicking here. 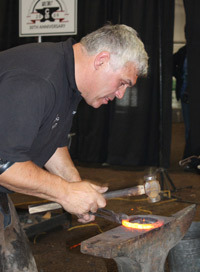 "A massive thank you for our Judge Ian Gajczak, he did a fantastic job throughout a very busy day and he was exceptionally pleased with the standard of shoes made during the day so well done to all the competitors. 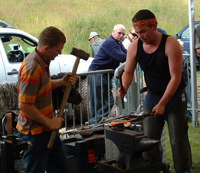 Also for all the helpers throughout the day these include Graham Harland, John Hick,Garry Harland, Simon Jackson for bringing the fires and everybody else that helped making the competition run fantastically well throughout the day." 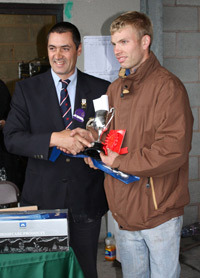 'Vortex' was judged to be the winner of the WCF Best Shod Horse at Badminton Horse Trials. 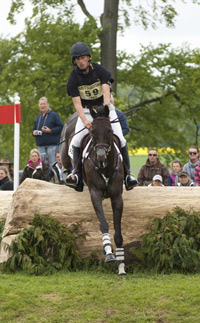 Ridden by Tim Price (NZL) and owned by Jonelle Richards and Rider, Vortex finished a superb 20th overall. 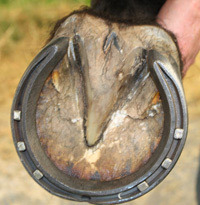 Vortex is shod by Andrew Nicholls. 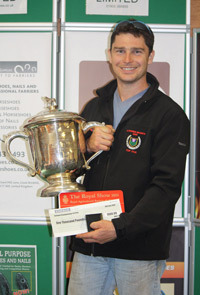 Badminton was won this year by Oliver Townend and Flint Curtis, owned and bred by Edward and Robert Nicholson. 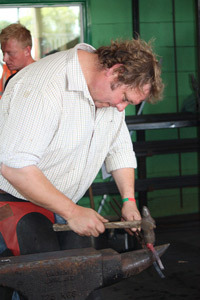 Flint Curtis is now shod by Jim Blurton and Forden Farriers since Oli's move to Ellesmere in Shropshire. 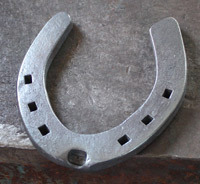 The first Dutch horseshoe factory, Werkman & Co., was located in Groningen in 1909. 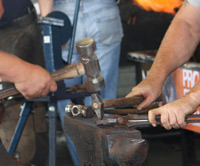 Now 100 years on the business has celebrated with a grand event on 7th , 8th and 9th of May. 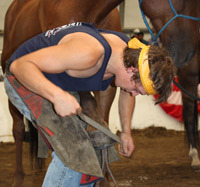 Farriers, vets and equine professionals gathered from all over the world to mark this wonderful occasion. 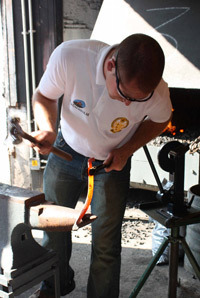 Werkman & Co has developed the craft of forging shoes into high-tech production. 30,000 shoes are produced a day in fully automated production lines. 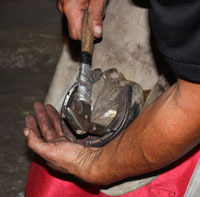 Well-established and a world player in the field of horseshoeing Workman’s is continuing to be at the forefront of the shoe manufacturing business. Reian and Christel have recently joined the company in managing the business and supporting their father, marking the fourth generation in Werkman’s history. 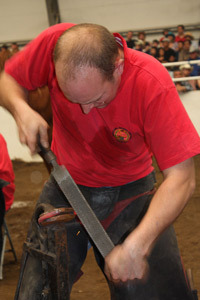 World famous farriers and vets shared their knowledge by giving clinics, lectures and demonstrations. Hans Castelijns, Derek Gardner, Rob Renirie, Loïc Entwistle, John Stewart, Ulrich Wenger, Mitch Taylor, Robert Pinkney, Billy Crothers, Michael Puhl, Aart Bloem, David Canes and Dag Reiersen discussed a wide variety of subjects ranging from daily problems to the latest developments, research and findings in the field of horseshoeing. 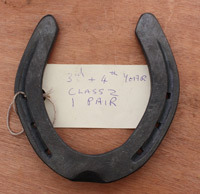 90 competitors took part in the competition in classes which included a ‘surprise’ shoe, eagle eye and specimen shoes. 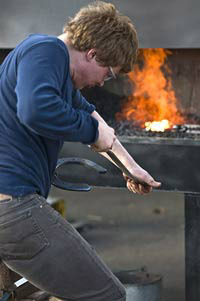 The apprentices also shod a morbid specimen. 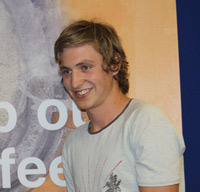 The overall winner of the competition was Gerrit Jan Salm (Holland). 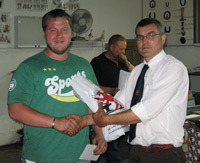 Billy Crothers went home with the second prize and Derek Gardner won the third prize. 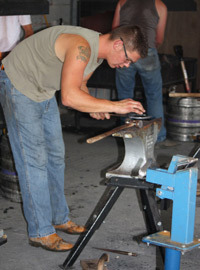 The pot luck contest challenged competitors to make objects out of scrap steel. 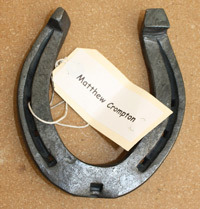 A flying bird, a cobra and a wine holder were amongst those auctioned off for The Flying Anvil Company charity. 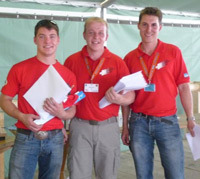 This organisation supports farriery colleagues all over the world in less developed countries by sharing knowledge and offering help. 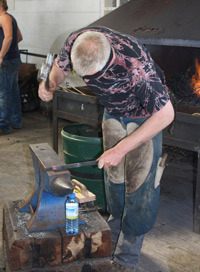 The weekend was a resounding success – both informative, competitive and entertaining! 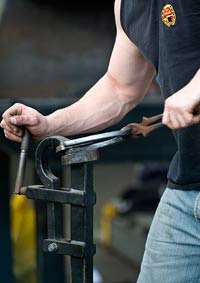 Forge & Farrier extends their congratulations to Werkman’s on such a wonderful landmark and wish them all the best for the future! 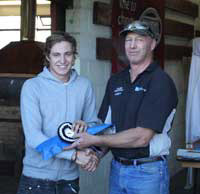 Most Workmanlike Apprentice- Tom Watkins. 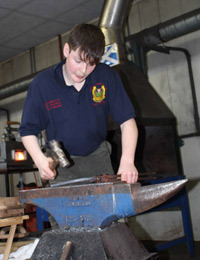 A total of 36 apprentices and 16 qualified farriers took part in a successful and enjoyable competition. 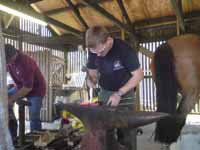 The day ran smoothly with everyone on time and the organisers would like to thank all of those who participated and of course the judge for the day Robin May AWCF..
And also to Derek Murfitt for bringing the cobs used in the shoeing class. 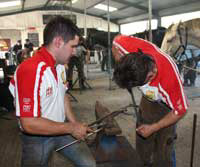 Forge & Farrier does have complete results including all scores for the competition. 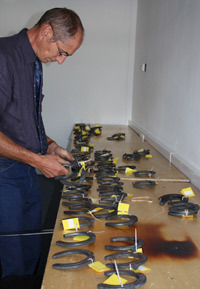 If you would like to know your individual marks please email us. With thanks to Craig Trnka for providing the results and images. 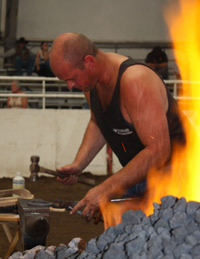 For more details regarding the World Championship Blacksmiths visit their website. 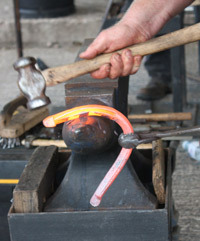 If you would like to know your marks and position for individual classes please email claire@forgeandfarrier.co.uk. 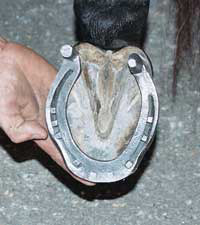 Click here for a breakdown of these results. 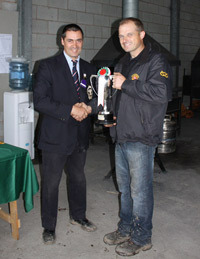 Hosted this year by the British Army this competition was a complete success and an enjoyable time was had by all. 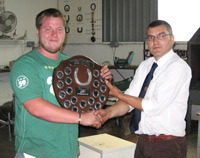 James Haigh won a Bronze Medal and the Farriers Cup for Overall Best Apprentice. 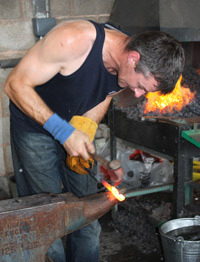 Steven Beane won a Silver Medal & Rose Bowl for gaining most points in Class 3, He also won “Best Prepared Foot” and a bronze medal for Open Shoemaking. 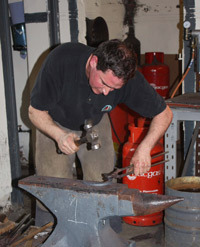 Iron and nails kindly donated by A J Pledger & Co Ltd. 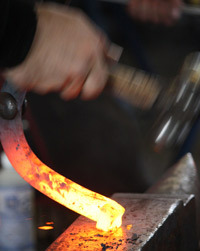 Forge & Farrier would like to thank Sylvia Adams for these images - they are a small selection of a fantastic range. 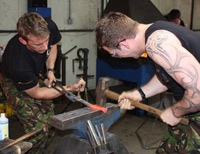 If you are interested in viewing more photo's or would like to purchase an image please contact her via her website - www.apersonalviewphotography.co.uk. 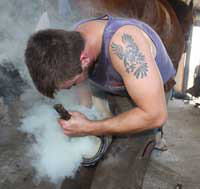 Four AFT members, along with two alternates, leave Convention as international representatives of the American Farrier’s Association. 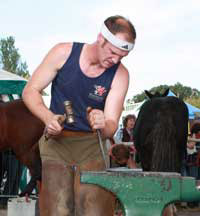 While traveling to competitions, AFT members serve as informal ambassadors of the AFA and the horseshoeing profession in the US and North America. 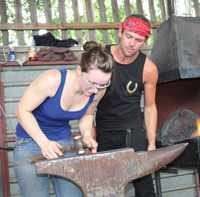 Conscious of the support of the AFA and the entire farrier industry, AFT members make a concerted effort to share what they have learned in international competition with the AFA community. 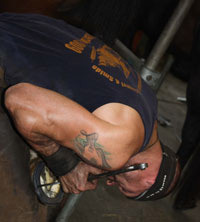 Look for complete team coverage in upcoming issues of Professional Farrier™ an Official Publication of the American Farrier's Association™.